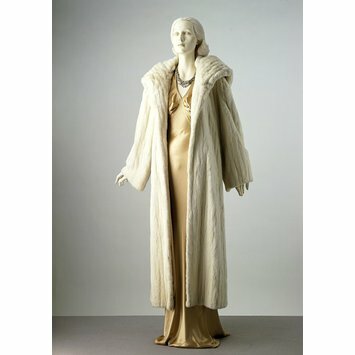 This stylish evening coat is typical of the 1930s Hollywood look, with its combination of gold satin and supple white ermine. Its designer, Madeleine Vionnet, was born in 1875 in Aubervilliers, France. Apprenticed to a seamstress at an early age, she worked in the Paris suburbs in her late teens before joining Kate O’Reilly, a London dressmaker, in about 1897. 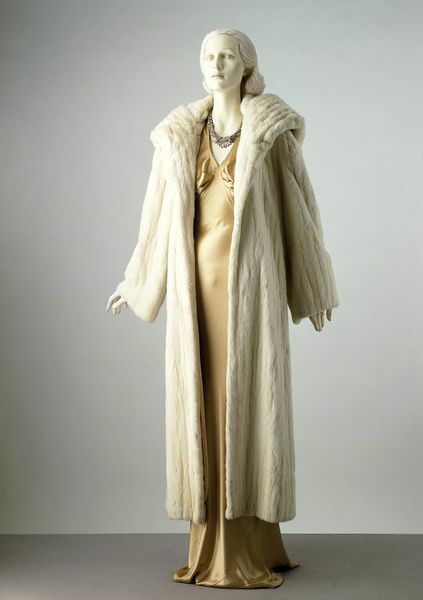 She returned to Paris, working with David Bechoff, Callot Soeurs and Douçet before opening her own house in 1912. Her work was interrupted by the World War of 1914-1918, but she re-opened in 1918, moving to 50 avenue Matignon. Vionnet retired in 1939. Evening coat of narrow and vertical white ermine skin strips. The sleeves are wide and slightly flared. The coat is non-fastening and fits edge to edge down the front. A large falling collar with turned back edges begins at the top front and falls over the shoulder ending in a straight horizontal edge at shoulder blade level. The skins are ribbon reinforced, faced with a light cotton then interlined with plain weave undyed wool and finally cream satin.